Yesterday, I was sitting, temporarily distracted, at my desk, gazing out the sliding glass door into the garden while chatting with the hubster on the phone. All of a sudden the finches and Oregon Juncos scattered wildly off the hanging bird feeder as a red-tailed hawk swooped down and landed on top of it. Now, just so you know, this kind of thing doesn’t usually happen around here. We live in a tract home near the center of a small town. We have a ‘burban back yard that, yes, has lots of trees but, no, doesn’t qualify by any stretch of the imagination as raptor habitat. So having a big ole’ hawk fly in, land, and pose a scant ten feet away was rare and momentous. For me, oh great adorer of all things wild, it was akin to an angel sighting. I was struck. Moved. Awed. And then it flew away again. The warp in the time/space continuum righted itself, and the world returned to normal. And now I’m struck, moved, and awed all over again. (And a little jealous. THEY got an eagle.) I wonder what’s going on? We’re having some strange weather right now, way too warm with lots of rain that’s melting all the mountain snow prematurely. Low areas are flooding and I’ve seen numerous hawks flying over the hills where I walk Dane the Mangy Rescue Mutt every day. Usually, they don’t return until spring. Has the unseasonal warmth tricked them? The scientific part of my mind is intrigued. But there’s this older thing down inside me, too, perhaps in my brain stem (involuntary body control) or amygdala (emotions and memory) that greets these wild creatures as messengers. When this old thing stirs and rises, it often feels like something uncoiling in my stomach. There are certain kinds of stimuli that tend do activate it, like hearing a hawk cry echo off the hills, or when a dry puff of wind brushes loose hair across my neck, or when something rustles in the dark, or when I sense a potential pattern in the smattering of random events that populate my day. It’s an involuntary, physiological response that I’ve had since I was a child, one that I’ve always just accepted and carried around with me in my pocket like a knife or a compass. It’s a valued tool and I like it. I listen because it tells me things about the world that I need to know, things my busy conscious mind doesn’t usually notice. It whispers stories about big things and old ways, warns me when I’m in danger, tells me when I need to pay attention because something important is happening. It uncoiled yesterday when the hawk came, then again this morning when I heard about the eagle, whispering something about wild things calling. It filled me with a deep sense of longing. I think I’ll take Dane and head back up into the hills now, climb the ridge to the top of Widowmaker where I’m finally alone with nothing but mountain ranges stretching across the horizons. I need to climb today, up into the wind and sage brush and sun and silence, where I can shake off the world, take my mind, and throw it far away up into the sky. Let it soar for a while. 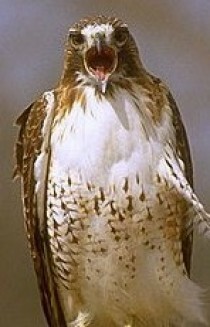 The red-tailed hawk told me so. Reminds me of an incident about a month ago when we were deluged in unexpected depths of snow in the city. I was hurrying out to my car on some mission__ phone to my ear, mind elsewhere. When I looked down the street, I saw los tres amigos shuffling diagonally across the intersection a block away. Dogs? Large cats? My brain spun, trying to make sense out of what my eyes saw. I swear, they almost looked like they’d linked arms and were laughing out loud as they hunkered across the snowy street. My brain finally focused and told me that these were, indeed, three masked bandits__racoons. I’ve never seen them in my very car-full neighborhood.I have seen them further out in the ‘burbs,and along the river, and on quiet north end streets. But HERE? Practically in the crosshairs of Boise & Broadway Avenues? By the time I got to the intersection, they had vanished into the neighbor’s shrubs. Later in the day, I walked down there to double check my vision. Yes, indeed, there were three sets of raccoon tracks! Odd. And you must have heard about the coyote that was sighted all over downtown last month, right? Tourists were taking pictures of it and the KBOI did a special on it for the evening news? Are the boundaries breaking down now? Hmmmmm…. I have just had a similar experience with a pair of foxes!do they trump your hawk? and your friend’s eagle? Nothing trumps an eagle sighting around our house. Sorry. But I’ll tell you what, a pair of foxes courting in the moonlight on top of a runner duck house? That one warps the space/time continuum on a whole new level! ← I have a secret.